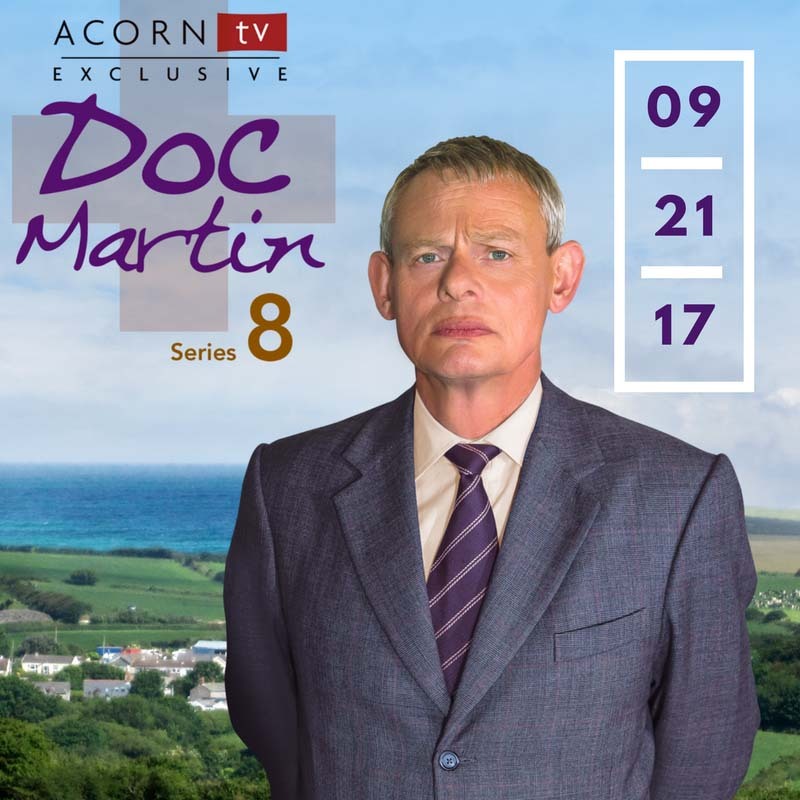 Silver Spring, MD; September 13, 2017 – In partnership with DRG, Acorn TV, North America’s most popular streaming service focused on British and international television, is thrilled to announce the return of one of the most popular series in Britain and Acorn’s best-selling series with Doc Martin, Series 8 beginning its Exclusive U.S. Premiere on Thursday, September 21, 2017, the day after its British premiere on ITV. BAFTA winner Martin Clunes (Arthur & George, Men Behaving Badly) returns in his uproarious lead performance as a tactless, self-centered, and uptight doctor in a quirky seaside town in Cornwall. After having therapy to save their marriage in the last season, Doc Martin and Louisa (Caroline Catz, Murder in Suburbia) face the challenge of living happily together with their baby, James Henry. The new eight-episode season premieres every Thursday through November 9, 2017 when the complete season will be available for binge-watching. Acorn TV is also excited to announce its October slate led by its newest Acorn TV Original Series, Irish conspiracy thriller Acceptable Risk. Called “completely addictive” (Slate) and “absolutely bloody hilarious” (London Evening Standard), Doc Martin is one of the most successful British series in the U.S. with new fans continuing to discover the series on Acorn TV, public television, and on Acorn’s deluxe DVD and Blu-ray sets. In the U.K., the series remains one of ITV’s highest-rated drama series. The series is also a global phenomenon, having sold to more than 70 countries, with licensed local versions in France, Germany, Spain, Russia, and many more. Acorn TV features the previous seven series available to watch anytime and recently created and added the behind-the-scenes documentary, Doc Martin: It’s Always Sunny in Portwenn, with the cast and crew reflecting on eight seasons on the series and a sneak peek at Series 8. Set in the fictional town of Portwenn, Series 8 features returning favorites Dame Eileen Atkins (Upstairs, Downstairs, Cranford) as the Doc’s formidable Aunt Ruth, Ian McNeice (Doctor Who, Rome) as Bert Large, Joe Absolom (Hatfields & McCoys) as his son Al. Additionally, Series 8 guest stars include Art Malik (Cold Feet, Homeland, True Lies) and another guest turn by Martin Clunes’ Men Behaving Badly co-star Caroline Quentin. Doc Martin is created by Dominic Minghella, produced by Buffalo Pictures, and distributed by DRG. Coming up in October, Acorn TV features Acceptable Risk (Acorn TV Original Series), a high-end, transatlantic co-production. This brand new six-part drama stars Elaine Cassidy (The Paradise, No Offence) in an edge-of-the-seat thriller which follows Sarah Manning (Cassidy) as she comes to realize how little she knew about her husband, Lee, before he was murdered. Her growing suspicions around his death lead Sarah to confront a powerful conspiracy of corporate, police and political interests. Exclusive U.S. Premiere begins Monday, October 16th. Also in October, Acorn TV features the return of Scandinavian drama Black Widows, Series 2; Clive Owen in 2000 British detective drama Second Sight; a documentary on The Queen’s official residences with Penelope Keith’s At Her Majesty’s Service; more episodes of Trial & Retribution from the creator of Prime Suspect and with an early guest turn by Michael Fassbender; fascinating documentary Witches: A Century of Murder; and three M.R. James Ghost Stories timed for Halloween. In addition to Doc Martin and Acceptable Risk, Acorn TV’s Fall 2017 slate is filled with must-see new dramas and returning favorites, including the final seasons of intense, award-winning cop drama 19-2 (Friday, Sept. 22) and hit BBC One detective drama George Gently; plus new Kay Mellor BBC One drama Love, Lies and Records, and Aussie legal drama Newton’s Law (Mon., Sept. 11); as well as exclusive new seasons of several of Acorn TV’s trademark series, including addictive Aussie period drama A Place to Call Home and New Zealand detective drama The Brokenwood Mysteries. Called a “glorious streaming service… an essential must-have” (The Hollywood Reporter) and “Netflix for the Anglophile” (NPR), Acorn TV (https://acorn.tv ) curates the very best in international television and is North America’s most popular streaming service for British and international television. From RLJ Entertainment (NASDAQ: RLJE), Acorn TV is also the greatest value in streaming at only $4.99 a month or $49.99 a year. Acorn TV exclusively premieres several new international series and/or seasons every month from Great Britain, Australia, New Zealand, Ireland, and Canada.